Leeds United officials have an appointment with Serie B side Carpi in Milan today as they move to snap up striker Jerry Mbakogu. 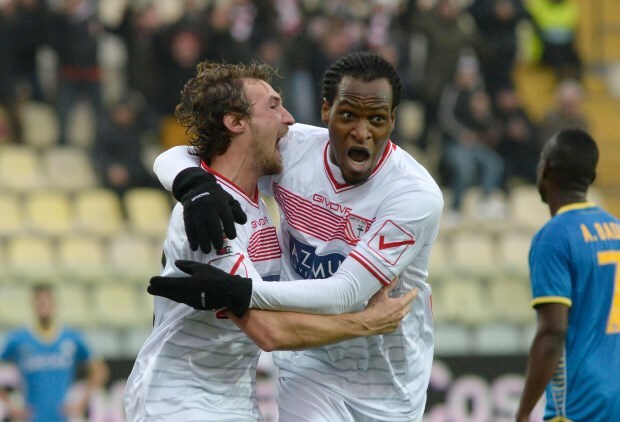 The Nigerian has impressed in Serie B with Carpi this season and was on the scoresheet at the weekend in a 2-1 win over Spezia. Scouts from Leeds were in the stands to check on Mbakogu and they appear to have submitted one final glowing report which has prompted the Whites to move to secure the player. According to Italian sports daily Gazzetta dello Sport, Leeds officials are to hold talks with their Carpi counterparts in Milan later today. They are expected to agree a €7m deal to sign Mbakogu. However, Carpi have been insistent that the hitman should not leave this month as they battle to secure promotion to Serie A. And it is claimed that the deal for Mbakogu to join Leeds will only go through next summer. Leeds have been looking to sign a striker this month, but it is unclear whether they will move for anyone else after agreeing a deal for Mbakogu.